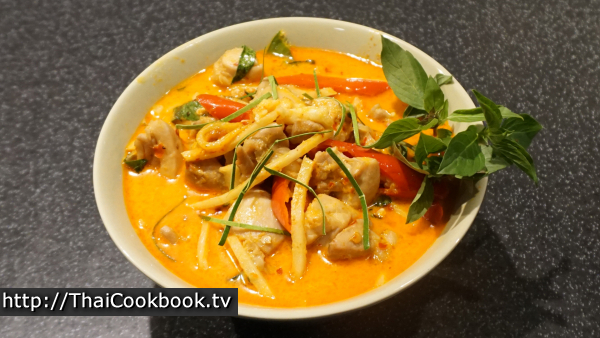 This lovely red curry dish is typical of the type of curries served in Central Thailand, where the soup base is made with coconut milk. 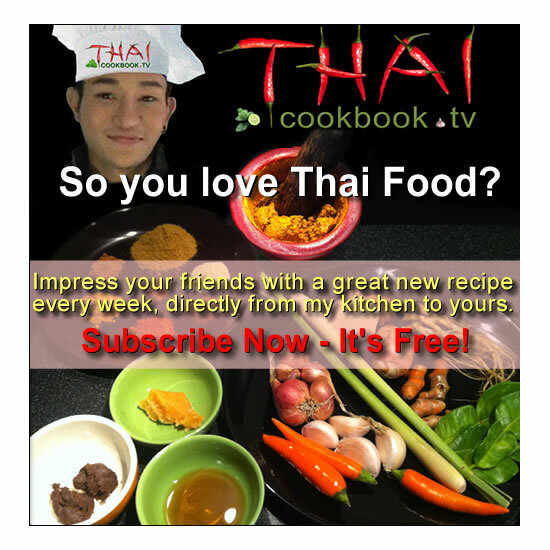 It's made with juicy chunks of chicken thigh meat, has a smooth and creamy texture, and deliciously exotic flavors from the fresh lemongrass, galangal, kaffir lime, dry roasted cumin, coriander, and peppercorns used in making the Thai strong red chili paste (Prik Kaeng Ped). 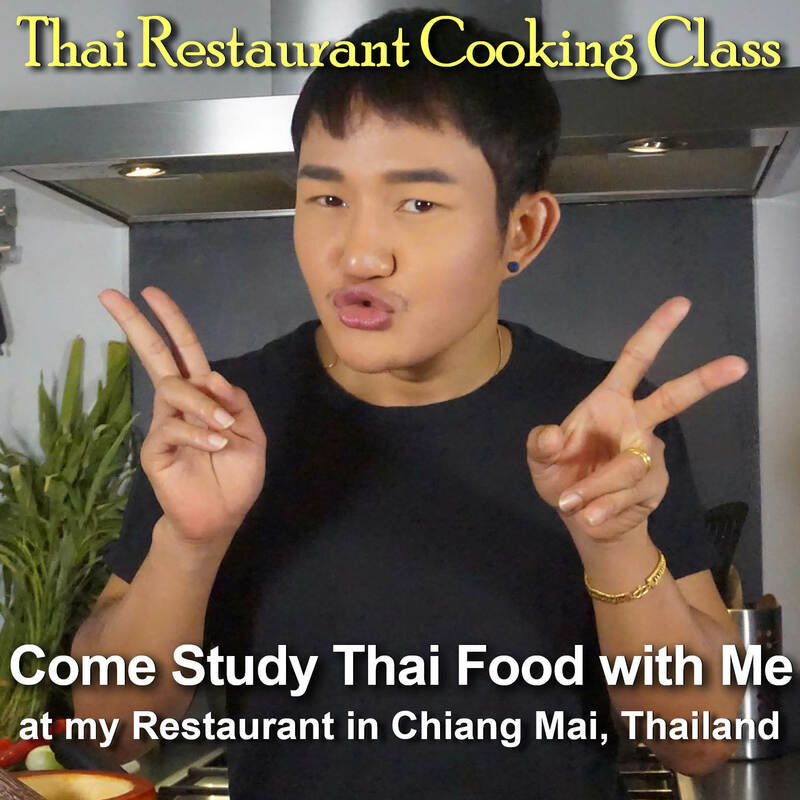 Using a packaged red curry paste to make this dish is completely acceptable, but if you want to do the whole recipe from start to finish yourself, prepare our delicious homemade red chili paste recipe first. You'll be glad you did when you see all those gorgeous bits of red, yellow, and brown in your finished Kaeng Nor Mai, knowing that you made them all with your own two hands. 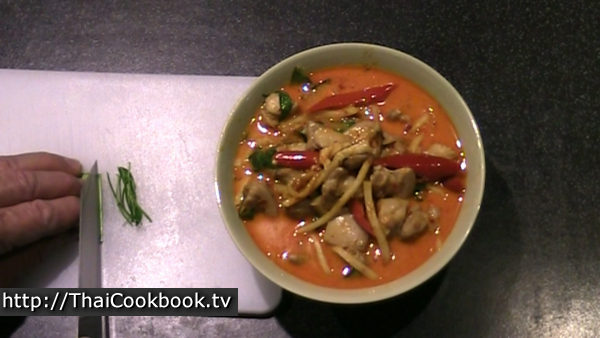 What's in our Red Curry with Bamboo Shoots and Coconut Milk. 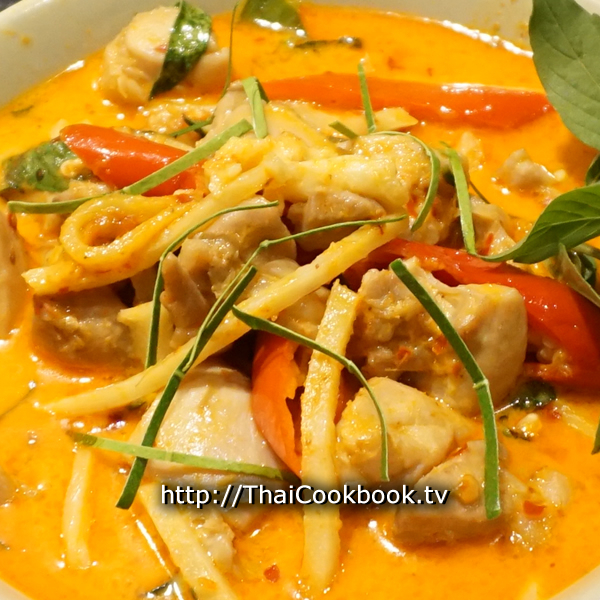 How we make our Red Curry with Bamboo Shoots and Coconut Milk. 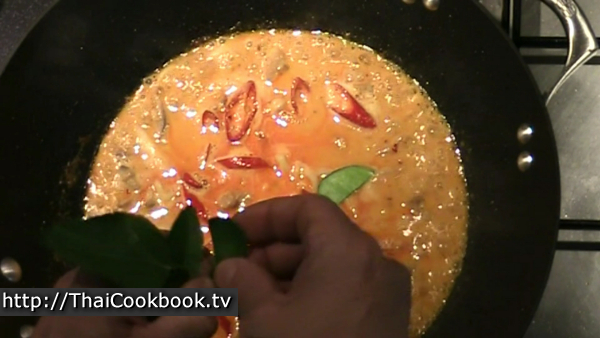 1) Heat half the coconut milk in a wok or pan, then stir in the curry. 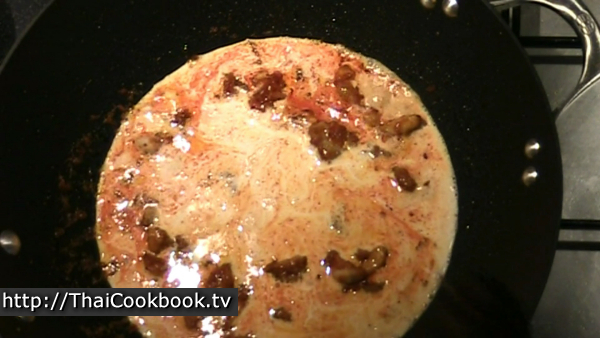 Cook it on low heat until it is thick and well blended. 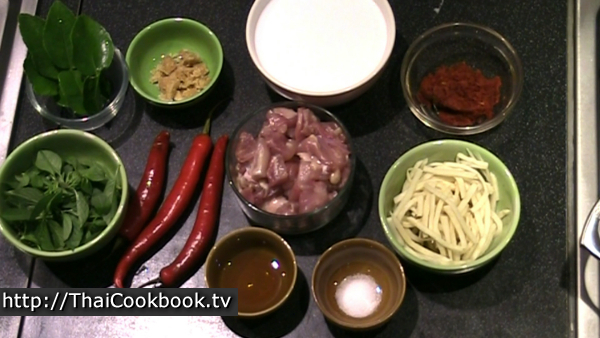 2) Add the chicken meat and fry it in the curry for about 5 minutes, then add the other half of the coconut milk. 3) Add the bamboo shoots, red chilies, and pieces of kaffir lime leaf. Cook for 5 minutes, then let it cool down. Stir in the basil and serve. Cut the chicken thigh meat into 1/2 inch cubes. Divide the coconut into to equal portions. Pluck the leaves and flower tops from the basil. Cut the red chilies diagonally. Measure and have ready the rest of the ingredients. 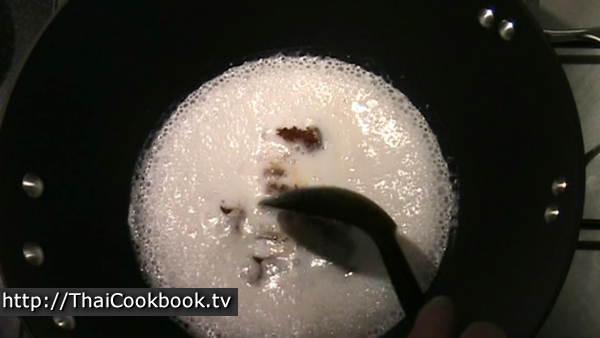 Add one half of the coconut milk to a warm wok or frying pan. Keep the heat low so it just barely boils. Add the red chili paste and stir it in well. 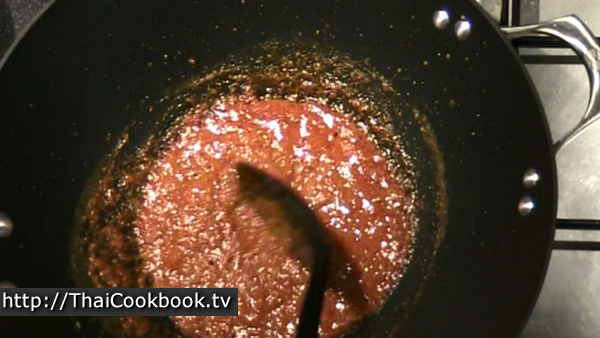 Reduce the coconut and chili mixture until it is thick and oily. Add the coconut sugar and stir until it melts completely. 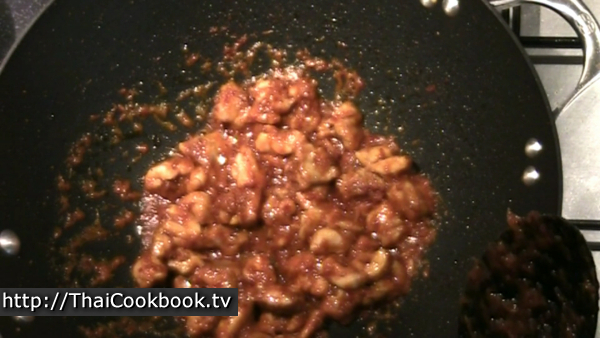 Add the chicken to the pan and stir it into the red chili curry mixture. Fry on low - medium heat until the meat is completely cooked and the pan is dry and sticky. Add the other half the coconut milk to the pan and stir it in to make the soup base. Add the bamboo shoots and bring back to a boil. Taste the curry. it should have a slightly sweet taste, a little bit spicy, and a little salty. Don't worry if it taste a little too salty, as this curry is eaten with plain rice and that will absorb a lot of the saltines. However, if it needs more salt, add fish sauce or salt until the flavor tastes right to you. Add the red chilies. Tear the center stems out of 3 - 4 kaffir lime leaves, and add the half pieces to the pan. Stir everything up really well and bring to a slow boil for 2 - 3 minutes. Turn off the heat and let the curry cool for about 2 - 3 minutes, then stir in the basil leaves. Serve in a small bowl just big enough to hold it all. Slice one kaffir lime leaf into very thin slivers and sprinkle them on top. Garnish with fresh basil tops.